Ulm has much symbolic power for the Danube Swabians as it was the point of many departures to southestern areas of Europe in the 17th and 19th century. The city was of great importance for the emigrants since the Danube became navigable from here and it thus was the first landing stage for voyages to Vienna. Many people came to Ulm and often stayed a while in order to work or wait for the possibility to get on a ship, the so called Ulmer Schachtel (literally: “Ulm’s boxes”) down the Danube. The fresco-secco painting on Ulm’s Town hall reflects Ulm’s major importance as a trade town upon the Danube. From 1670 onwards, ships, so called "ordinari ships", went on a regular schedule from Ulm to Vienna. Thousends of people from the whole of the country came here to start their journey to Hungary from Schwal, a little island in the Danube from where the ships took off. Only after Emporer Joseph II had issued an edict of tolerance in 1781, the mostly Protestant inhabitants of Ulm were allowed to migrate to Hungary themselves. Up until then, the Austro-Hungarian dual monarchy had only wanted Catholic men with their families to settle the areas depopulated after the Ottoman Rule. In 1784 and 1787, 850 inhabitants of Ulm decided to settle in Hungarian regions. Many emigrants spent a couple of days or even weeks in Ulm. This was especially profitable for those who owned taverns or inns since the emigrants had to eat and find lodgings. Many of them worked in Ulm for some time in order to improve their finances for the journey. Many couples who had only met each other on the journey married in Ulm, since only married couples were given farmlands. As Ulm was a Protestant city, the couples had to be married in a Protestant ceremony. Many of them thus married two times: once in Protestant fashion in Ulm Minster and later Catholic in Wengenkirche. What is unique about the migration pattern from upper Swabia to Hungary is that there was not only a wave from Germany to Hungary, but also re-migration into German regions. In 1712, thousands of Swabians gathered in Vienna who had not been able to stay in Hungary due to lacking infrastructure. A part of them was sent back to Germany in the fall of the same year. Suffering from exhaustion, disease and disappointment, their first stop was Leipheim, where they received medical treatment and later had to organise the journey back into their hometown. From 1980 onwards, Ulm has been in close contact and exchange with the Danube countries. Of central importance for this are the Council of Danube Countries, which is headed by Ulm’s Lord Mayor, the Danube Swabian Central Museum, the Danube Festival and the Donaubüro. Several memorials and commemorative spaces for migration, flight and displacement of Danube Swabians have been built by organisations of Danube Swabians with support of the city of Ulm. Furthermore, many organisations hold regular meetings in the city which is so symbolic for them. 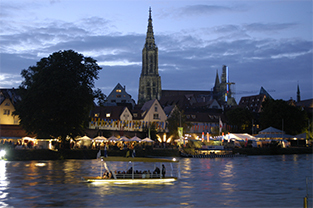 The International Danube Festival is held in Ulm every two years. The two-week-long festival has participants from all Danube countries. Every year, Ulm’s Lord Mayor gives his traditional Schwörrede (“pledge speech”) from the balcony of Schwörhaus. This day is celebrated like a holiday in Ulm. 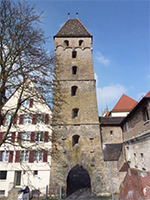 LEFT: The gate of Metzgerturm leads into the city. 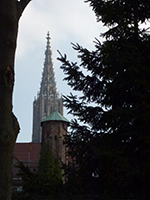 RIGHT: Ulm Minster’s tower can be seen from many parts of the city. Opening hours: daily from 9 am to 4 pm, the tower can be visited. 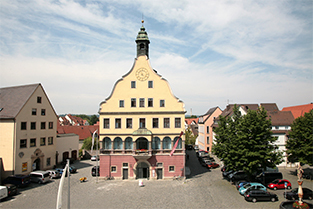 The Schwörrede (literally: “pledge speech”) is held yearly on the second to last Monday of July at 11 am on Weinhof (wine square). It lasts about one hour. In the afternoon, the “Nabada” (literally: “bathing down the River”) can be seen on the Danube. Opening hours: Mon to Sat 9 am to 6 pm, Thur 9 am to 8 pm, Sun and bank holidays 11 am to 6 pm.